William (Bill) Flaude Morris, Jr. died on December 28th, 2017 at The Oaks at Mayview in Raleigh. Bill was born on August 18th, 1920. He attended Broughton High School and went on to graduate third in his class from NC State University with a degree in Mechanical Engineering. Shortly after, he married Dorothy Donaldson and joined the Air Force. He served as a Captain in the 585th Bomb Squadron stationed in France from 1943-1947 and received the Bronze Star for service to his country above and beyond the call of duty. After returning home, he and his family settled in Raleigh. In 1949, he and C.R. 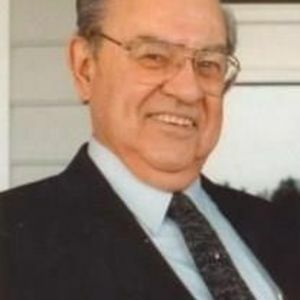 Farinholt, his longtime friend and business partner of 50 years, founded Morris & Associates, Inc. Bill proved to be a pioneer and visionary in the Thermal Storage Industry. He designed and developed patents for the first and largest Turkey/Poultry Chiller. Morris & Associates has been one of the world's leading manufacturing companies of refrigeration products for the poultry industry for over 60 years. One of his ice maker designs for commercial markets is still manufactured today. His continual development of new products earned him nineteen patents and the Governor's New Product Award for his Thermal Storage Ice Harvesters. Continuing in his father's footsteps, he has been a longtime friend of NC State University, often hiring engineering graduates at Morris & Associates. Over the years, Bill has received many awards including recognition in the NC Poultry Hall of Fame, awarded by the NC Poultry Federation, and the Distinguished Engineering Alumnus Award from NC State. His name is also on a bell in the NC State Bell Tower. Bill is survived by his wife, Marsha, of 38 years, his daughters, Nancy Southern, Patty White, and Muriel Groce; his sons Bill Morris III, and Brad Morris; his thirteen grandchildren and fourteen great-grandchildren. He is also survived by his sister, Jean Webb, who resides at Glenaire in Cary. The family wishes to express our deepest thanks to Linda Davis, Paulette Spruill, Dae Chapin, Olumide Alebiosu, Tee Usman, and Cornelia Settle, his devoted caretakers, for their genuine compassion and care. Over the past years, it has exceeded our expectations and been a true blessing in our time of need. Funeral services will be held on January 2nd, 2018 at Christ Baptist Church, 400 Newton Road, Raleigh, NC. Visitation will be held from 9:30-10:15am. The service, officiated by Dr. David Hogg, Rev. Don Owen, and Bill Macklin, will begin at 10:30am. Interment will follow at the Historic Oakwood Cemetery. Those wishing to do so may make donations to: First Baptist Church of Raleigh, 99 N. Salisbury Street, Christ Baptist Church, 400 Newton Road, or NC State: College of Engineering.